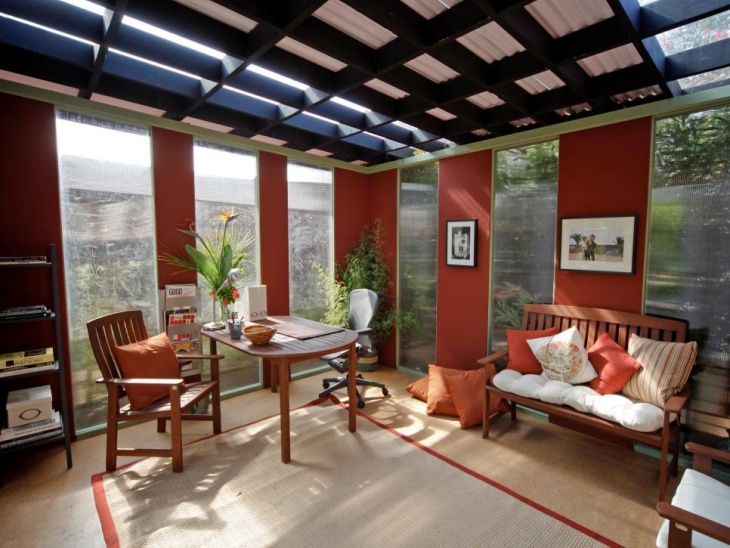 Sunrooms are some of the most personalised outdoor chambers in your house. People find pleasure in spending long hours in these rooms to relax their nerves. When it comes to selecting the design for the ceiling, most of the people try to go for the traditional designs. 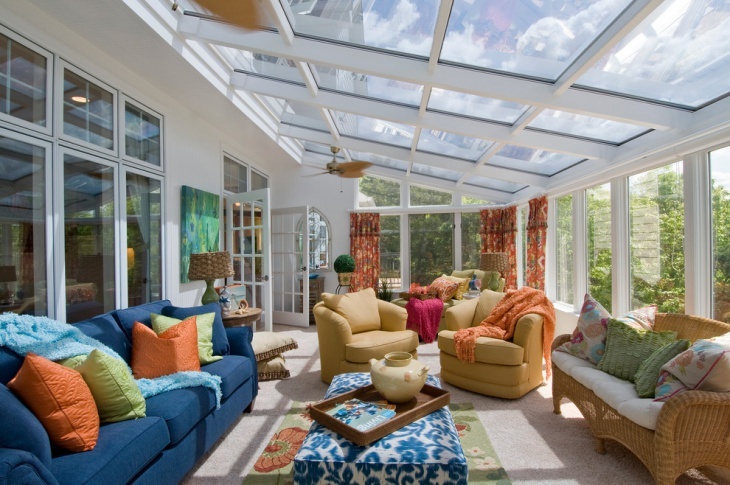 However, sunroom ceiling ideas can be greatly customised as per the interior of these rooms. 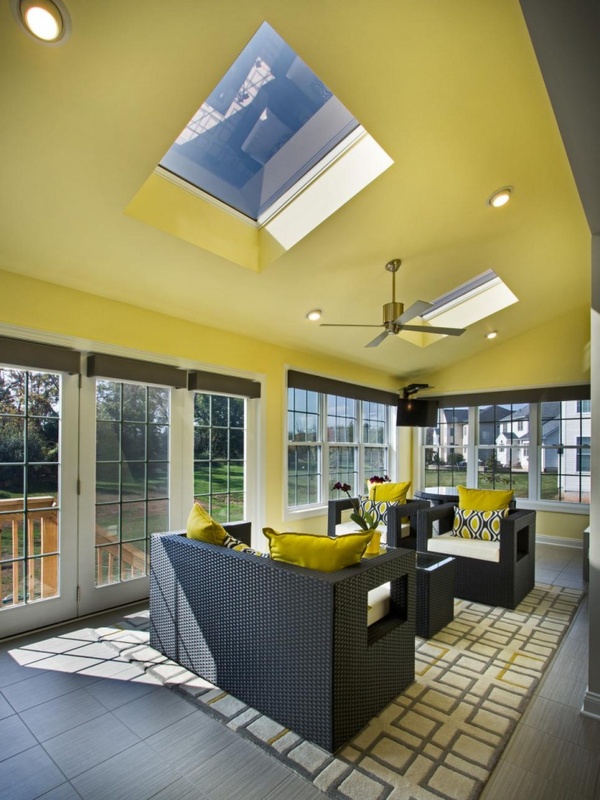 Even a Small Sunroom looks classy when you design the ceiling to perfection. 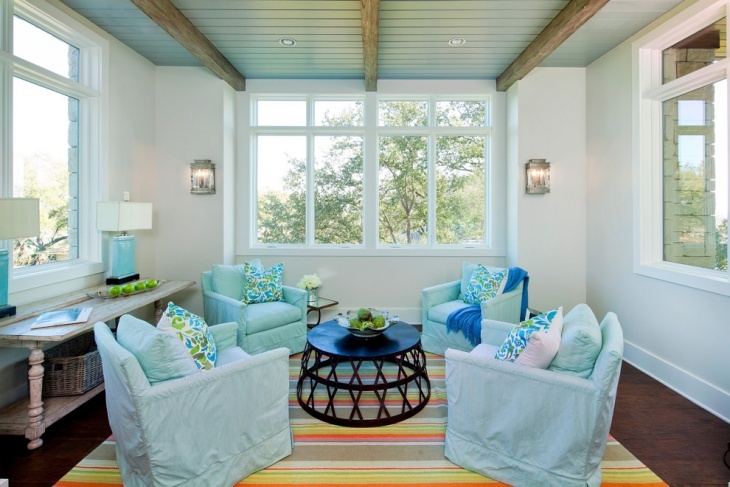 Here are ten sunroom ceiling designs that you will find beautiful. A rustic sunroom with a white False Ceiling looks grand when you have dark coloured furniture to complement the room. 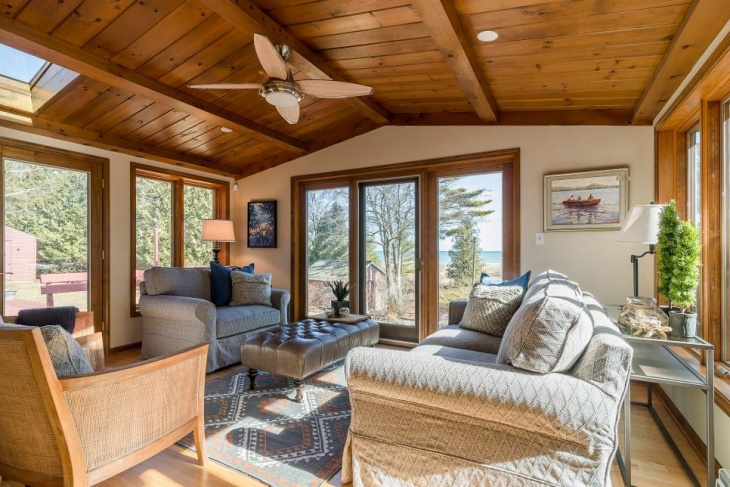 There are exposed beams that look beautiful, and the room has large glass panels with wooden beams in between. A rock-finish for the fireplace is ideal for the room. Here, the Living Room Ceiling is beautifully made of glass with thin white wood frames supporting the structure. It is a perfect garden room and you can get some cane furniture to yield the perfect beauty here. Elegant wooden furniture delivers a rich attire to the room. When you have wood-panelled walls for a living room, a dark wooden ceiling makes the room complete. The color contrast of the room is great, with a brown-and-white combination. The white sofas and furniture, along with a glass-topped table is ideal for this room. A small sunroom with brick flooring looks good when you have a simple exposed wooden ceiling. It is slanted towards the exterior and has vinyl siding. The white room gets a glamourous look with colorful crockery in the room. The old-fashioned fans suspended from the beams are perfect for the room. 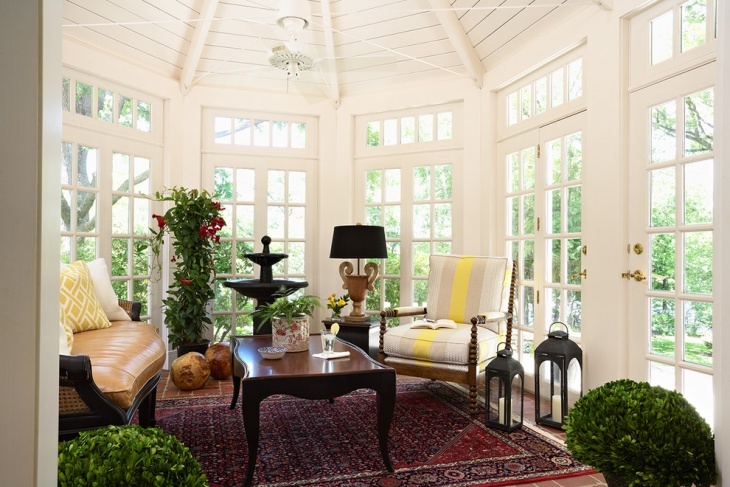 When you have a bright and beautiful sunroom with a cottage-like ceiling, you can make it even more elegant. 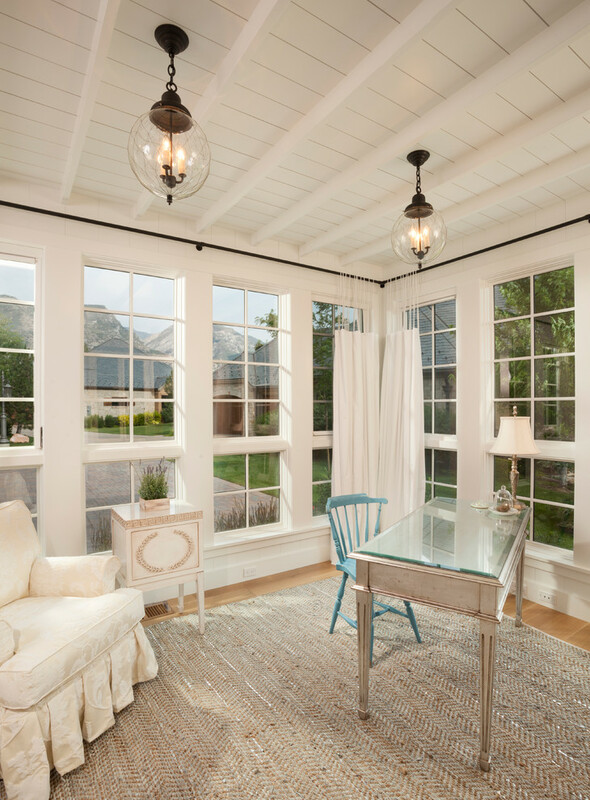 The wooden ceiling in this setting goes well with the white window frames and elegant furniture. Place a glass table in the centre with sofas around it for the perfect sitting arrangement in the personalised room. Modern sunrooms live on the perfect utility of space. You can incorporate the diagonal couch idea in this room for better looks. There are ceiling windows, and the bright and beautiful room is ideal for people who love to live on riversides. Hang an elegant ceiling light to yield the perfect elegance here. 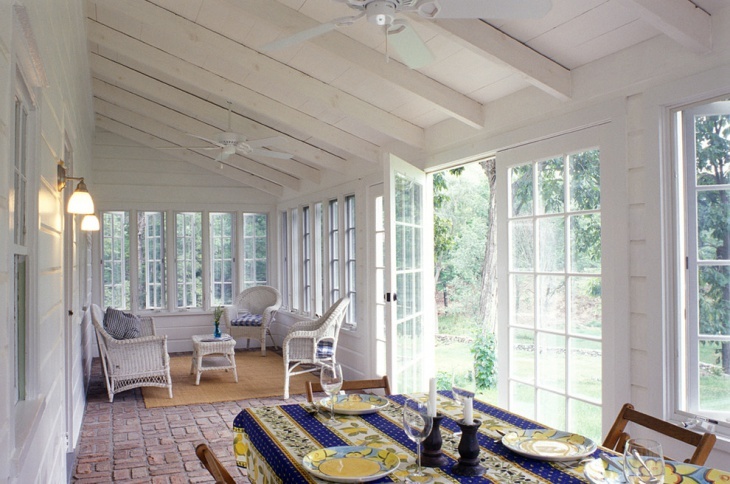 For a change, you can blend a beautiful architectural design in the sunroom. Here, you will find a traditional wooden door, white interior with a raised ceiling resembling a tomb. An embroidered carpet with a brownish-red color matches well with the elegant wooden table in the centre of the room. 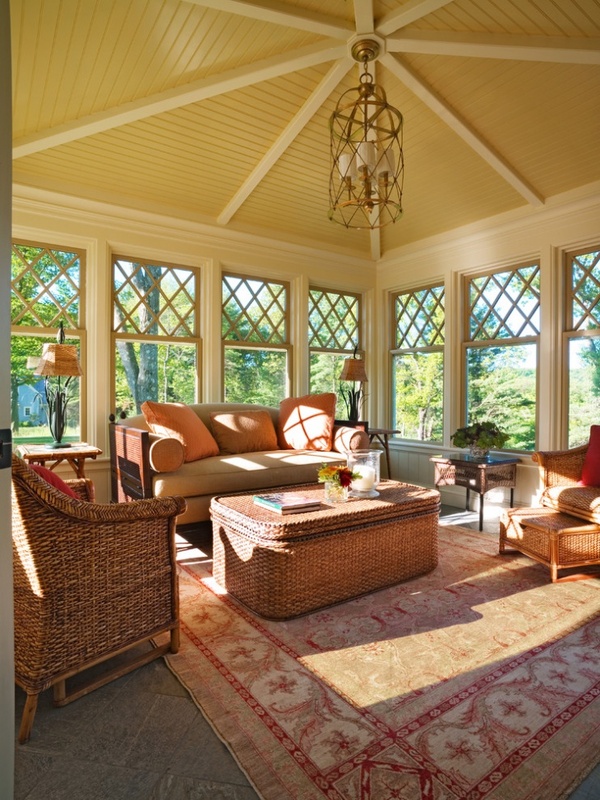 A weathered ceiling made of oak wood can make the sunroom sophisticated. A blue tinge adds beauty to the bright room. Arrange the porches and dark central table in a square pattern to make it a bit formal. The white wooden beams in the windows are compatible with the decks and floor. 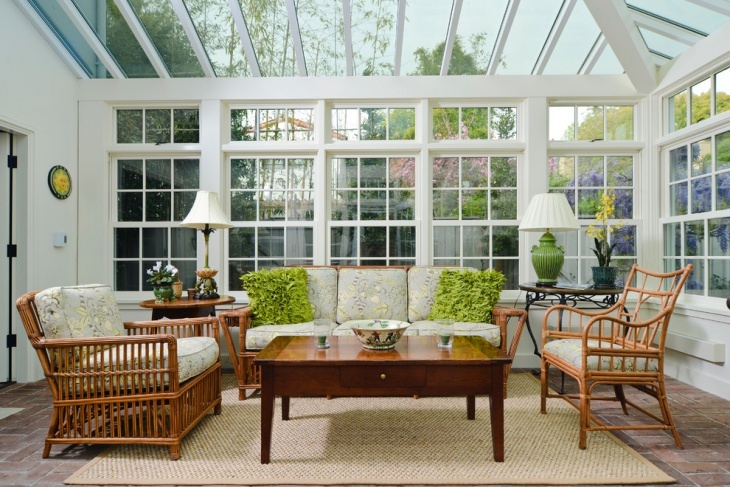 A royal sunroom is an asset to its owner. 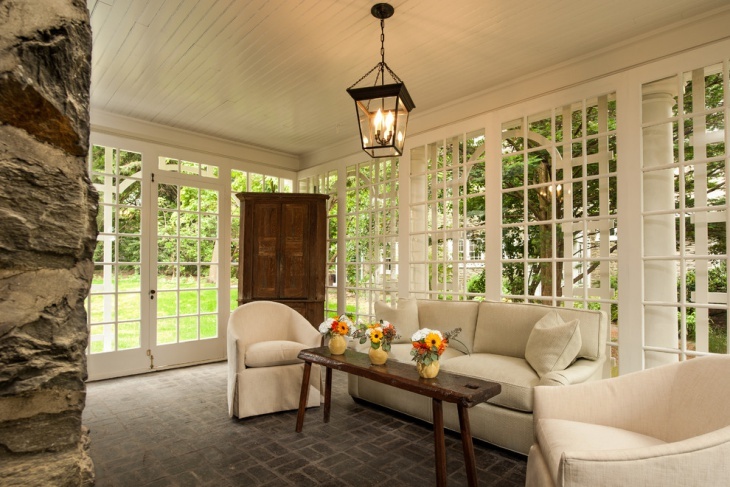 You can get a Victorian ambience in your sunroom when you opt for wicker furniture. This has the perfect compatibility with the tan roof and golden ceiling is perfect for the octagonal structure of the room. When you have a Modern Sunroom at the back of your head, you can incorporate various sunroom ceiling ideas tailored to perfection. With the change in living styles and attitudes of people, new ideas are cropping out each day. You may innovate something classy for a personalised sunroom, and you can definitely share the idea with us.